Holy Habanero! It’s HOT in Here! The number of hot sauce manufacturers has also grown. A surf around the web will turn up multiple hot sauce vendors, with literally thousands of hellish sauces to choose from. Who could resist? The sauces are not only tasty, but usually have lavishly designed, colourful labels advertising the contents. Could you possibly turn down a bottle of “Area 51 – The Hot Sauce that Doesn’t Exist“? Or “Professor Phardtpounders Colon Cleaner“? What about “Toxic Toad“, “Spontaneous Combustion“, “Da Bomb” or “Death Nectar“? 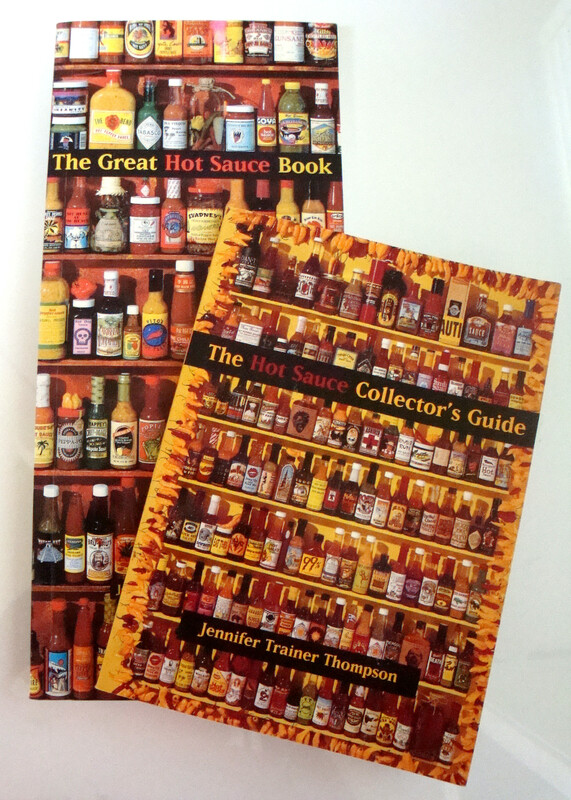 Just two of many books published on hot sauces. As long as we love to torture our mouths and digestive systems with these tasty, but HOT, HOT, HOT sauces, they will keep on comin’. Go ahead…spice up your life, but remember, a little goes a very-long-way! This entry was posted in Collecting, Collections, Cookbooks, Cooking, Food Fads, Food Trends, Guinness World Records, Hot Sauces, New Mexico, Uncategorized, Vintage Cookbooks and tagged cookbooks, Cooking, Guinness World Record, Hot Sauce Manufacturers, Hot Sauce Vendors, Hot Sauces, Scoville Heat Scale, Southwest, Sue Jimenez, Vintage Cookbooks, www.hotsauce.com. Bookmark the permalink. 1 Response to Holy Habanero! It’s HOT in Here!